FYI....if you have the Head you need to "flip" the rows of 12ax/at7 tubes left to right. 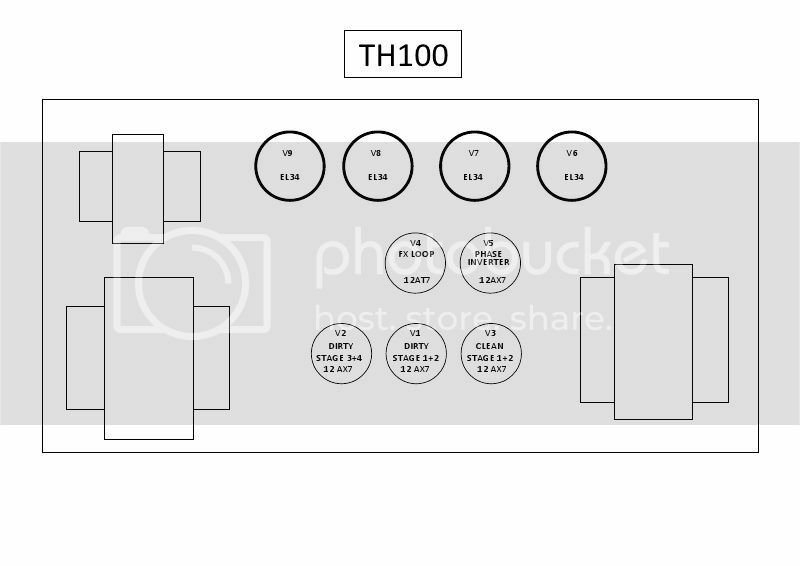 Based on the above can I assume this is the layout for the RV100H Mk I? But what is V1, V2, V3 etc? grahamp wrote: Here is the TH30C in an overhead view if you have the chassis pulled with the tubes pointing up. this post confuses me. namely the suggestion of "flipping" the preamp tube rows. why would i want to do that when the diagram matches the physical layout of my RV Mkii head EXACTLY? i could be wrong but his statement seems questionable. can someone verify either way? I think the original poster is confused. The control labels are flipped as the combo's chassis sits upside down in comparison to the head . Not the tube positions. Does anyone have a diagram of the Rockerverb MKIII 100? 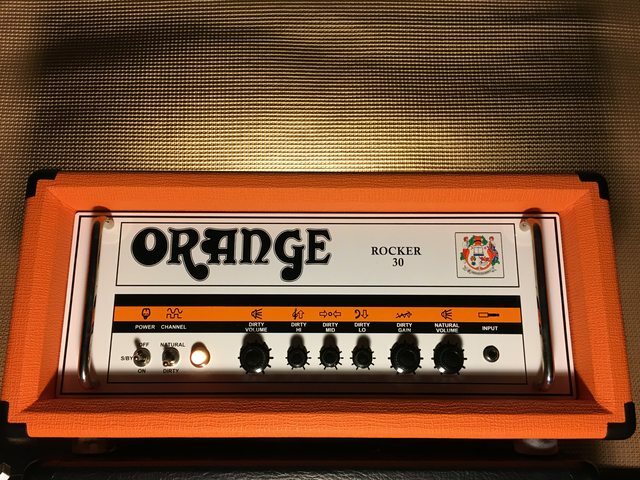 mmcwill wrote: Does anyone have a diagram of the Rockerverb MKIII 100? 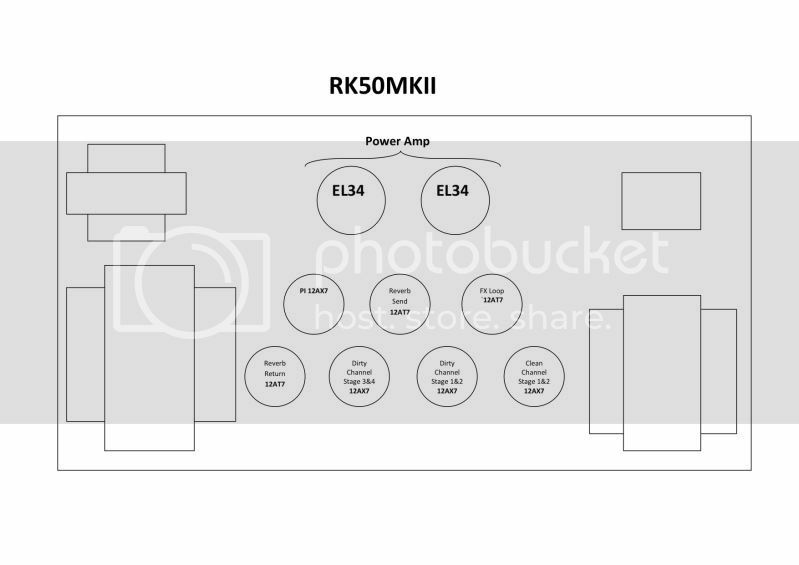 Unfortunately, the MKIII layout pdf link is no longer active. Looking at the back of the amp is it V1, V2, etc. from left to right? CS Stratocaster, CS Telecaster, partscaster Cabronita, Orange AD50 CS, OR15H, PPC 112 x2, Victoria 45410, Strymon Flint, El Capistan, Sweet Honey OD, JHS Bolt, Keeley Comp, Tiny Orange Phaser, Peterson Classic tuner, Pedal Power 2 Plus. 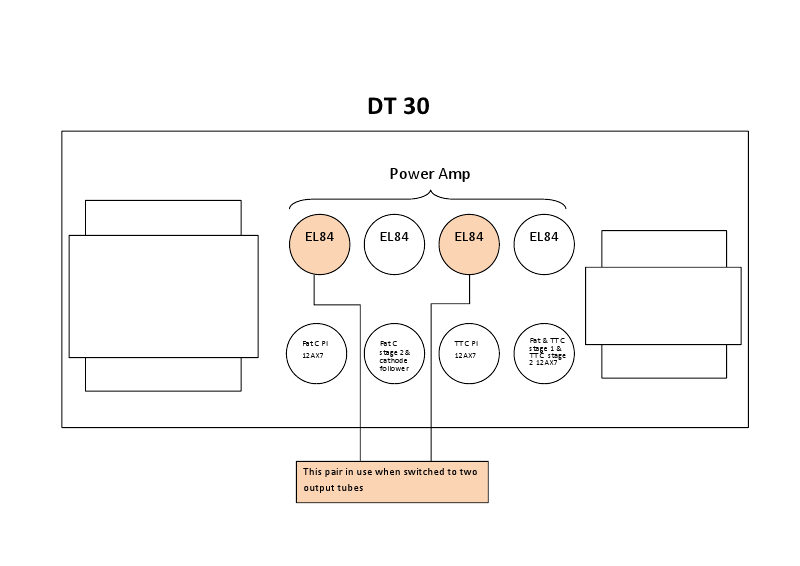 After a little bit of due diligence, I have discovered that in the AD50 CS the tube nearest the power tubes is in fact the phase inverter. Is there anything special about the tube that goes in the phase inverter or is the tube socket just different. Is there a layout for the Rocker 15 yet? Based on the physical layout it seems it may be the same as an OR15, but an official layout would be nice. Anyone knows where I can find the tube layout for a Dual Dark 50?